So it didn't work out as planned! I really need to go shopping and relieve stress! First try with rub ons on glass. Make a Wish and Enjoy Your Day! I just adore how bright this paper is! How fun and EASY this card was. 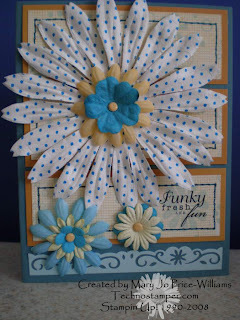 The flower is cut from the Bali Breeze dp and the sentiment is a rub on from the Anchored set! Got to love it. The only thing even remotely difficult was the sewing. 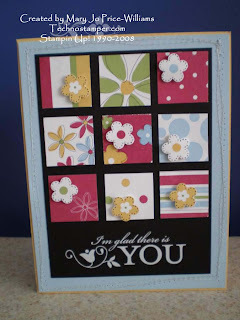 The layout is from this week sketch challenge on SCS161. Here is a really quick and silly card. The inside says, I get by with a little help from my friends. 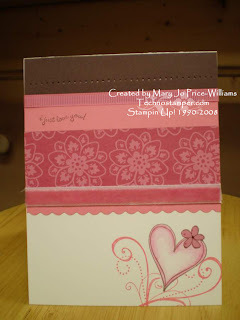 This is another personal challenge to my self -- I have hundreds of Non Stampin Up! stamps that just never ever get used. I have had this silly image from Image Tree for years and it has never even seen ink. I am challenging myself to use some of these stamps that are hidden away in large pizza boxes (22 of them). 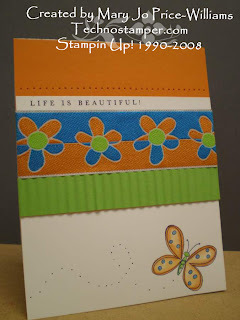 Hope you don't mind a little Non Stampin Up! once in a while. Maybe one a week???? I hate to have all of these just sitting around and I can not bear to sell them when I have not even used them, lol! And here is more cards for the sketch challenge this week. The object of this card -which was a personal challenge to myself-was to make a Easter card with all current SU sets even though I have no current Easter sets! Hmmm, that took some thinking, lol. But I did it and I kind of like it. What do you think? I know it looks like a simple card but there is really a lot going on with it. 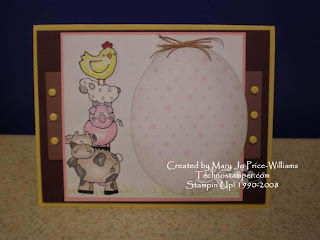 The little chick is from the Nursery Necessities set. The grass is from the stem in the Time Well Spent set. 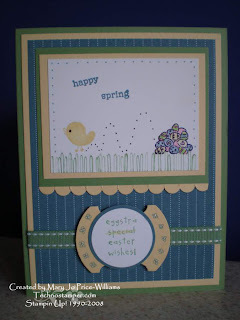 The pile of eggs and the main sentiment is from Loads of Love Accessories while Happy Spring is from Everyday Flexible Phrases. The base of the card is Wild Wasabi followed by Barely Banana and then a piece of the Blue Bayou dp. The focal image is done on Whisper White and layered on Barely Banana and Wild Wasabi. The scallops on the bottom were made with the scallop circle punch. 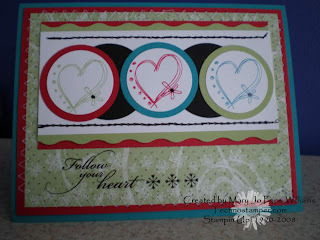 Sentiment is stamped on Whisper White and punched out with the circle punch and layered on a Blue Bayou circle and than a Barely banana round tab punch left open. The little flowers and the dots are all free hand. 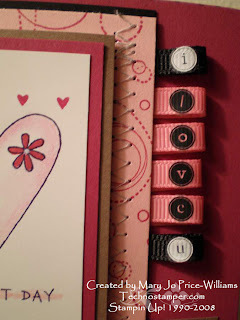 Other supplies used were markers and ribbon. This was fun! Well, this is turning out to be a fun couple of day! NOT! Yesterday late afternoon I lost my internet connection so I could not do anything on line. Well we all know that that can easily put you behind. Well after a couple calls to my carrier we managed to figure out what the problem was and I was back up and running -- but oh so tired, so I decided I would post the new card challenge players in the morning. Well then the storm hit I am have been with out power for most of the day, lol! It's always something! The good news is my son and I have been able to play board games all day long, that was much needed! Anyway, I just wanted to post a few more cards for Monday Lunchtime Sketch Challenge #2. Everyone is doing such an awesome job and this was kind of a hard sketch! Lovin all the samples, hope you are too. All of the samples are wonderful ladies. I am thrilled so many of you are playing along. I have seen others if you post a comment on here I will link to yours too! Come on you know you want to play too. I am off to try the sketch on SCS now. Thanks again and hopefully I will be back soon with a card of my own to share. This weeks sketch was a bit more difficult than last weeks but just as fun! 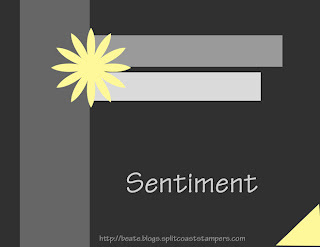 Don't forget to comment here if you play along so I can post your sample too. If you upload to SCS please use TSSC2 in the key words so we can see them all at once! Happy creating. I am really having a hard time photographing my cards lately. It has been kind of gloomy around here. I think I need to break down and create photo box?? Anyway, this was a fun layout for me. It is the first time I am using the Berry Bliss dp and I love it. The base of the first card is Pretty in Pink followed by a layer of Purely Pomegranate that has the swirls from Baroque Motifs embossed with iridescent ice embossing powder to add a little bling. The large circle is a quarter of an eight inch circle cut from the dp. I added scallops around the edge in Pretty in Pink. Next I added some stitching marks with a Chocolate Chip marker. The focal image is from Fun and Fast Notes. 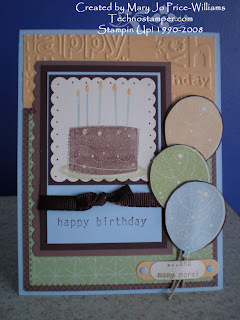 I stamped it on Shimmery White card stock and embossed it in Chocolate Chip. It is colored in using markers and a silver glitter gel pen. It is layered on two scallops circles and finally on a 3 by 3 square of Chocolate Chip. 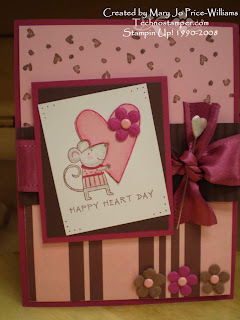 The Forever and Always sentiment is from a Studio G set and is stamped in Chocolate Chip on Close to Cocoa. I added the stitch marks here too. 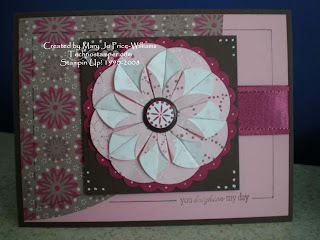 As a finishing touch I added the doubled up Prima flowers with the Pretty in Pink brad. The second card also fits the try a new technique challenge on SCS which can be found here. I wanted to use up the other half of the half circle I cut and I was so excited that this fit perfect with my sketch this week. The base of this card is Close to Cocoa followed by Pretty in pink. The sentiment is from Visual Verve. I drew the lines to add a little interest to the pink, I did not want too much with all the other stuff going on. I added those stitching lines on the quarter circle again too. Hope you like it. 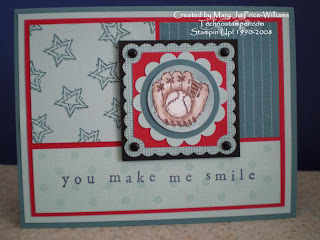 Here are the other talented stampers links to what they were able to create with the same sketch! They are beyond wonderful so check them out. How is that for talent! YIKES they are good. You want to try? Go ahead, when you do please post a link here and I will be happy to post in during the week. Can't wait to see what you come up with. You don't have to have a blog to play, upload anywhere you want. If you use Splitcoaststampers please us TSSC2 in the key word section! Have fun. Last few for this week - new sketch in a couple of hours! Last few links for the last sketch, new sketch will be posted by noon est. Come on back and play. I so enjoying all of these different samples done with one sketch! Thanks to everyone that has played. Please feel free to continue with this sketch when ever it strikes your fancy and comment so I can see. I will not be posting any more with this sketch though! Here area a few more challenge cards for last weeks sketch -- are you ready for tomorrows. It will be posted at noon EST so be sure to check it out. It is a little harder than this weeks but ohhhh so fun! Can wait to see everyone's samples. Don't forget you must let me know if you want your posted here-- just leave a comment on here and I will link you up! Remember you do not have to have a blog -- you can upload anywhere - If using SCS please use the key word TSSC1 no spaces. Here are the cards. Melissa @ What do you (th) Ink? This is so amazing you have to watch the whole thing. Awesome! There is more of her work here. More Monday Lunchtime Sketch Challenge Cards for your viewing pleasure. How fun is this? If you want your card posted here please leave a comment and let me know where to find it. Thanks to all of you that have been playing. Boy do I feel better today! Thank you Lord. 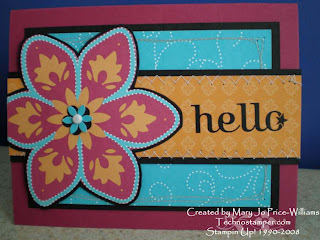 I am happy to say that I had fun stampin this morning and it seems my MoJo was just playing a little game of hide and seek. Well I am very good at the game, ask my son, so I found it! This card is for todays Limited Supply challenge on SCS. The challenge was to use scraps. Unfortunately I could do this every day for weeks on end all day long with no breaks and still not put a dent into my scrap pile! This is also a sneak peek at one of my future sketchs for my Monday Lunchtime Sketch Challenge. (this sketch will be way down the road -- since I could not seem to stamp last night I created a few more sketches) The little flowers are popped up and the saying is a rub on! The squares are one inch. All I can think of when I look at this card is "wanted -- to be able to stamp today" Yikes it was a tough day. Only made two cards and although I like this one better than the last, it is not real what I wanted again. Oh well, we do get days like this and the best thing to do is go to bed and start again in the morning -- right after this post I am doing that! 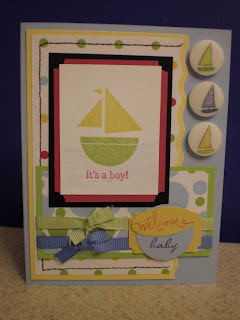 This weeks challenge was to use the layout on page 141 of the Spring Summer Stampin Up catalog -- the welcome baby card. I had a horrible time trying to get a clear pictures, the horse is not that washed out looking in real life. 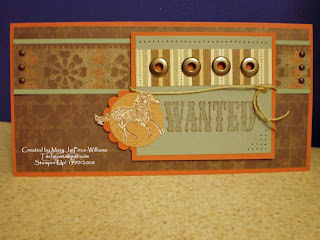 I used the Wanted and Bronc Buster stamp sets along with the retired Outlaw designer paper. 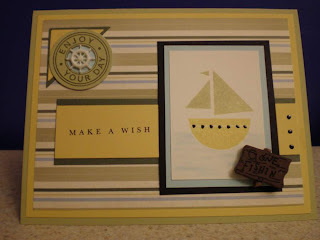 I also used Really Ruse, Sage Shadow, Creamy Caramel card stock. Other supplies: twine, brads, jumbo eyelets, circle punch, scallop circle punch, paper piercer, mat pack. Thanks for lookin, sorry about the bad MoJo day! Don't forget to check out all the other players on my sidebar. I am sure they have wonderful cards to share. Goodnight! 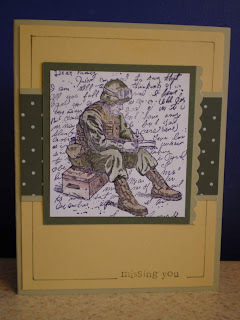 Did you ever have a wonderful idea for a card but when you are finished you look at it and think "what the heck -- that is not anything like I was thinking! YUCK!" Well this is what happened to me today. I decided to do the Ways to use it challenge on SCS for today. I don't often participate in this particular challenge because it gets posted too late for me to find time, but today I had to be home arguing with phone companies on the phone so what the heck! The challenge was to use paint on your card (real paint not ink). I did learn a few things today though so maybe I will share them with you! 1. If you are going to emboss on acetate make sure it is the heat resistant kind! 2 I do not like silver and pink butterflies -- I mean what the heck was I thinking? 3. Don't try to create while being frustrated by employees -- it is not easy to be creative. I painted on the back of a piece of acetate and then embossed the swirls on the front. I don't really want to look at this card too close to give you the rest of the details so if you have a question feel free to ask. The is some real creating going one elsewhere though that I want to share. Here are two more card for this weeks Monday Lunchtime Sketch Challenge! Great job ladies, thanks for playing. Did you ever feel like that? Wanna join me, lol! For today's sketch challenge on SCS. As you can see I turned it on its side. I pulled out another old retired set -- these sets are feeling left out lately so I felt bad, lol! And here is another sketch link for yesterdays Monday Lunchtime Sketch Challenge. Here is one more from me for the Monday Lunchtime Sketch Challenge number 1. This actually fits the color challenge on SCS for today too. (Real Red, Soft Sky and Blue Bayou) What a fun combo. 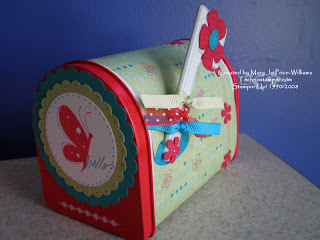 Stamps: Toy Box, Canvas, Simple Sayings !! 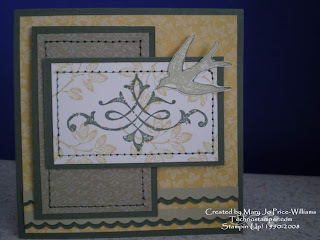 This is a simple card, designed to show off the Faux Tile Technique. I tried not to take the focus away from the technique by added lots of embellishments and layers. Hope you enjoy! Welcome to this new weekly event! Each and every Monday at noon (EST) I will be posting a sketch and challenging you to use it for inspiration for a project. 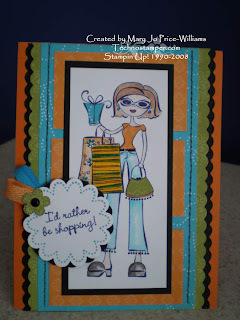 You can make a card, scrapbook page, gift bag or whatever strikes your fancy. The only rule is to share your creations (grin). You can upload your sample to your blog or anywhere else that you choose and then just leave a link in the comments so we can all see and let you know how wonderful your creation is! If you upload to Splitcoaststamper's please use the TSSC1 in your keyword section so that it will show up in a search. Hope you will play! I do have a wonderful group of 10 plus women that I am sending the sketch to early so that I can give you direct links to other samples for your initial inspiration so be sure to scroll to the end to see all the links! 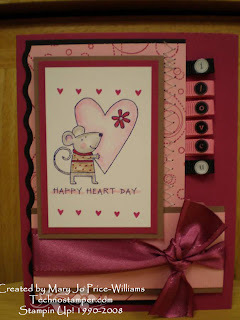 I adore this little mouse so of course I am gonna want to be using him way after Valentine's day so I needed to find more uses for him that did not include a big heart! This is my first attempt. He really could be holding anything at all! The possibilities are endless. Accessories: markers, watercolor pencils, blender pen and scallop square punch. 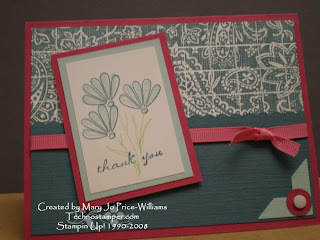 This is for today's Featured Stamper Challenge. You can see the card I chose to CASE here. 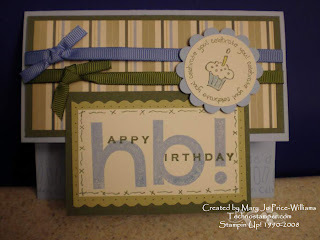 I changed the stamp set, colors, ribbon. Hope you enjoy. Also the size of the card is 4 1/4 by 4 1/4 and you can use regular envelopes to send! I like the size you will see more of it from me. WOW!! This was a tough one for me. The challenge was to use River Rock, Real Red and Bayou Blue. Not my favorite combination, but I guess that is why they are called challenges. All I could think of when I thought of these colors was stars but I wanted to use flower! So that "hard headed --stuck on one thing" person that I am stuck to it and here are my flowers. They were a labor of love to say the least! I promise to get my list of players up on my sidebar again. I have decided to put them back up -- I know I am also wishy washy at times. For now you can visit Pat's Blog and check out her sidebar for all the players. Also I will be adding another sidebar for you all to check out. Starting on Monday I will be doing my very own Sketch Challenges! I can't wait, I have a wonderful group who want to play along and I sure hope that you will too. Keep watching for more details. For now I NEED to get in the shower. A really simple Valentine! I wish it would have been as simple to get a good picture of it. Sorry. There are six different strips on the white base. The textures really look cool in real life. I love the chocolate chip and regal rose together. Hope you had a great day. 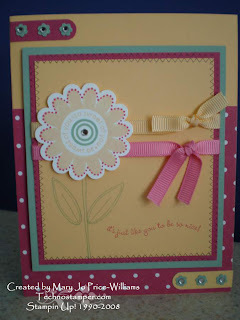 See you tomorrow with my Blogger's Challenge card! TTFN! This is for the Sketch challenge at SCS. I think it turned out pretty cute. I may even use it for my son for his 8th birthday????? I really had fun with this set. The cake and the candle tips are clear embossed. Hope you enjoy. Accessories: CB, VersaMarker, clear embossing powder. ribbon, Word Window Punch. I can see that this SAB set will be one of my favorite sets. It is sooooo versatile. I cut the center snowflake out of my stamp to create a two step stamp! I mounted the snowflake part on another piece of wood so I can use it separately. I LOVE this set. This is also for this weeks color challenge on SCS. Don't you just love this flower? Can you believe you can get this set for free during sale-a-bration. And the best part of this set is that it is die-cut! That's right, just pop the images out and mount them -- ready to stamp in minutes! Everyone at my class last night thought I was crazy when I was actually dancing around the room because I was so excited I did not have to cut out all those scallops! YIPPEEEEE! The colors and layout were somewhat inspired by a notebook that Beate posted on her blog and challenged us to use for inspiration. This was my first try with the rub ons on glass. Not too bad, although I did waste one when I messed it up by not rubbing enough and then could not get it re-set. There is one on the back too. I thought these little jars were so adorable. I got them at AC Moore for $1. I am not sure I am happy enough with it to go get more jars, but it was pretty darn easy. 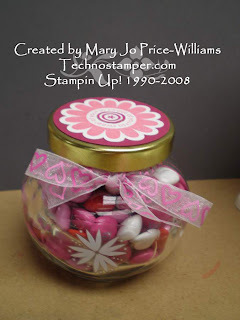 I was thinking teacher gifts for Valentine's. The flower on the top is the new SAB set -- I have more to show you but I am working on 3 hours sleep from last night and I am tired. This was my feeble attempt at creating a male birthday card that wasn't fishing or hunting or any of those other things that not all men are into. I figure everyone love a cupcake and if I don't jaz it up too much with glitter and other stuff it just may work. 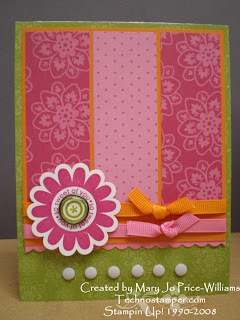 This type of card is called a kickstand card. Kind of like the opposite of a tent topper. I have made these before but they did not have an "official" name then, lol. Been a busy day as you can tell -- you should see the mess in my studio! YIKES! Not sure I will have time to post tomorrow so here is one more for today. It is another one for FS49. 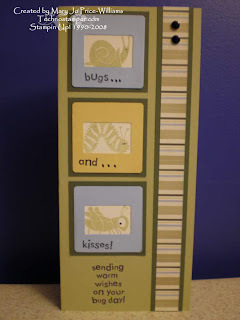 Here is the card I used for inspiration. One more for todays challenge. Here is the card I cased. This was fun, I love these colors and papers and of course the fact that it is a shaker is always fun. 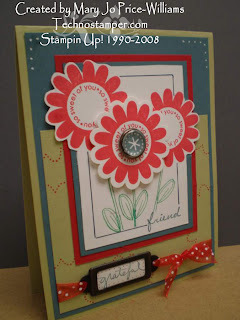 For today's featured stamper challenge on SCS. Here is the card I cased. I kept the basic layout and even the stamps but changed the colors and a few other minor details. Hope you enjoy. I think we will do this at All Occasion tomorrow! 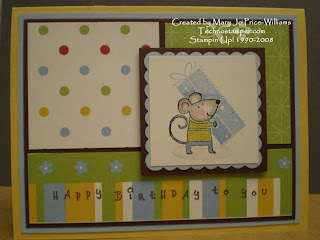 I created this card for the sketch challenge on Beate's blog. I had a horrible time with this card. I don't think it was the layout, but the fact that I was really determine to use the Be Happy set and may have chose too many colors to work with! Anyway after a bit of agonizing I think it turned out ok in the end. What do you think? ;the following was added by someone else but still rings true! Aren't these the cutest little things. I am thinking about giving these to my son's teachers for Valentines day filled with some kind of candy! They are from the dollar spot at Target. I actually used some retired designer paper on it and I am loving them. I did not want to do the whole "love" theme -- not that I don't love my son's teachers, but you know! Anyway this is going to be one of the club projects for tonight. I am letting them use the new rub ons on the front bottom. They are so easy to add that little extra with little effort. The colors used are Taken With Teal, Certainly Celery and Real Red. I also used the Garden Whimsy and Time Well Spent stamp sets. How fun is this little card. This is from a sketch over at Lauren's Blog. She is so creative and I just adore her work. I never did one of her sketches so this is my first. I had to alter the focal image size a bit to get the look I wanted. I am pretty happy with the results. Isn't this card just too cute? 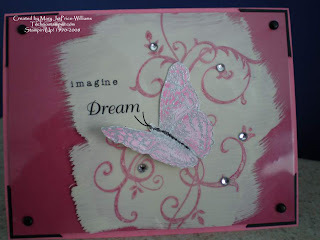 It is for today's featured stamper challenge on SCS. I love the colors and the simple design. Great for boys. Mine wants me to save it for his birthday, lol! Hope you enjoy. Accessories: mini black dots, sizzix slide mount die. This is for the Limited Supply Challenge 149 on SCS. 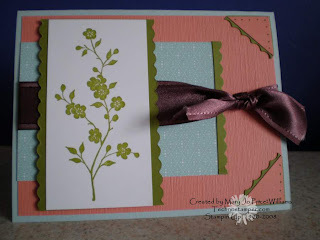 The challenge is to create a card using NO white or vanilla. I am not sure where I was going with this card, and I think it really shows, lol! I was using up scraps of paper that were within reach from my work area. I also wanted to use the little stitched square cuttlebug folder. 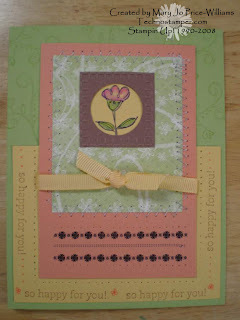 The flower in the focal image and the background are from the retired Doodle That stamp set. So happy for you is from the new Nursery Necessities set. The black floral designs on the bottom are from the Eastern Elegance Rub Ons. After embossing with the little folder I punched it out with the square punch and then punched a circle out of the center. Another Friday already! Yikes how time flies. (even if your not having fun, lol) The cool part is that I HAVE been having fun! I have been busy creating lots of stuff and enjoying every minute of it. 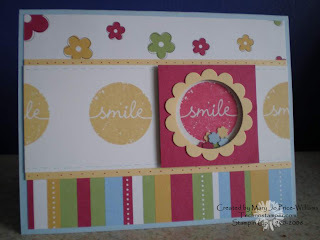 Here is my card for this weeks Blogger Challenge. 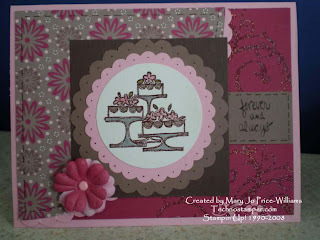 The challenge was to make a card using Pink and Brown. I already had my primas out from the last post so figured I would work them into this challenge too! Feels good to use up some of them. I also got to use the cute pins I found at JoAnn's the other day! Hope you enjoy it. I brayed Pretty in Pink over the Au Chocolate paper to have it match with the pretty in pink on the top half of the card. The heart is paper pieced and the middle strip is crimped (been a while since I used that tool). Today's Ways to Use it Challenge was to use flowers! Think I used enough?? I really like the way it turned out though. Can you believe two cards with one sketch in one day! Got to love it. This new set Happy Heart Day is Ohhhh so cute! Don't forget to check out the special on this set this month. You can find it here. Let me know if you want to order it. This card was fun to make. I love the colors and the new rub ons we have now work great on ribbon! Here is a close up for you to see. Can you see I did another card with my sewing machine too! Yippee! This is the most use it has gotten since I got it two years ago for Christmas. Today's sketch challenge card. I really like this new set. It is fun to work with. JoAnn's had their buttons on sale for 50% off so I bought a bunch. I think these ones are adorable. OK, my hubby says this card does NOT work! He says that no sail boater is "Gone Fishing" What do you think? The challenge to my self was to create a male card with a baby set. I had no idea where I was going with it but pretty much new the elephant wasn't gonna work, lol! So this is what it ended up with. 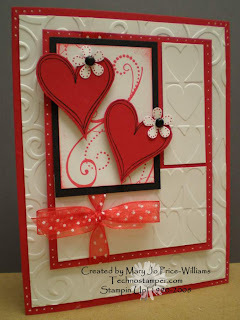 I think it is one of those cards that has just a bit too much yet needs something! I would love to hear what you think. Other: Black gel pen, photo corner punch, circle punch misc buttons and the new Rub Ons. I love these colors together. Who would have thought. This is for today's color challenge -- Real Red, Taken with Teal and Certainly Celery. I also pulled out an old sketch challenge for the layout. 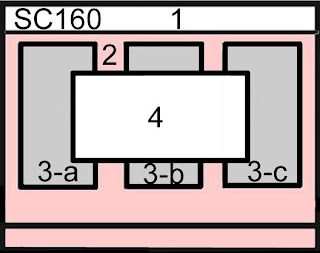 SC155. I used this a few times in previous posts and really like the layout -- obviously!